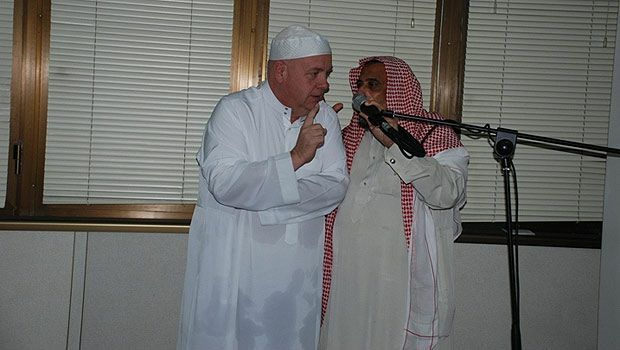 Professor David Roy Woelke of King Abdulaziz University is helped by Sheikh Abdul Elah Al-Ajlan of the World Assembly of Muslim Youth to recite the Shahadah during a brief ceremony at WAMY headquarters in Jeddah on Wednesday. In the top picture WAMY employees hug Woelke after he embraced Islam. David Roy Woelke, a Canadian English language instructor at King Abdulaziz University, embraced Islam at the World Assembly of Muslim Youth’s (WAMY) headquarters here Wednesday. Abdul Elah Al-Ajlan, deputy director of dawa programs at WAMY, assisted Woelke to recite the Shahadah (Lailaha Illallah Muhammad Rasulullah “there is no god but God(Allah) and Muhammad is the Messenger of God(Allah)” during a brief ceremony at the organization. Woelke, whose new name is Dawood, said he embraced Islam after he was fully convinced that it is the true divine religion. He conducted a comparative study of Islam and his former religion Christianity and noticed a lot of differences. “When I came to Saudi Arabia I realized how wrongly the Western media portrays Islam as a religion of violence and terrorism. In fact, it’s a religion of peace and universal brotherhood,” he said. The Canadian said he saw a totally different picture of Islam and Muslims in Saudi Arabia, adding that it was quite opposite of what has been projected in the Western press. “Many Muslim friends encouraged me to accept Islam as my religion. Once a Pizza salesman told me he wished to see me becoming a Muslim very soon,” he said, adding that deeper studies about Islam made him closer to the religion. He expected his family members would ask him about the Islamic teachings and how he would adapt with them. “There are a lot of misunderstandings about Islam in their minds. But I am quite sure that their impressions about Islam would change when I explain to them its various teachings,” he pointed out. “There is a vast distinction between faith and religion,” said Woelke. “Religion is a man-made institution but faith is the relationship between man and God,” he told Arab News. “I want to be busy working on my own relationship with God and not so busy about another man’s relationship with God,” he added. Soon after reciting the Shahadah, WAMY employees embraced Woelke and congratulated him for accepting the true religion. The dawa department at WAMY gave him a copy of the Qur’an and a number of Islamic books in English as a gift. Dr. Muhammad Badahdah, assistant secretary-general of WAMY, expressed his happiness over Woelke’s decision to embrace Islam. “Thousands of people belonging to different religions and nationalities, especially educated men and women like Woelke, are coming to the fold of Islam every year,” he said. The WAMY official reminded Muslim governments about their duty to propagate the message of Islam and urged them to establish a ministry for the purpose. WAMY conducts dawa programs in more than 70 countries through qualified Islamic preachers. “Muslims are responsible to take the message of Islam to other communities,” Badahdah told Arab News.